where we stayed in Auckland. hostel that I have stayed in. we went to in Rotorua. Tekapo; hanging out with Lorenz; drive to Fox Glacier. after hiking in Abel Tasman. 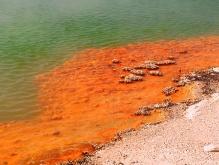 Smells: Sulphur in the thermal pools in Rotorua; post-rain; wines. 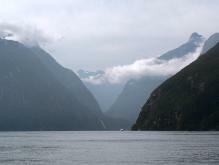 Sounds: Jim's smart-a*s comments; sheeps 'baaaa-ing'; waterfalls; rainforest critters. Cpe Reinga (Dune Rider trip was $99NZ); 90 Mile Beach; Bay of Islands. honeycomb butter; antipasto platters; kaumara (sweet potatoes); lamb; pumpkin and kumara hummus. ($40NZ); thermal baths at the Polynesian Spa ($15NZ); sand-boarding on sand dunes. Purchases: Earrings; 4 bottles of wine (2 Sauvignon Blancs, 1 Pinot Noir, 1 Chardonnay); umbrella. Fun Food Finds: Hokey Pokey (i.e. honeycomb); L&P soda; Tim Tams. Departure Tax? Yes. It is $25 NZ. other. The InterIsland ferry was about $225 NZ. Type of currency? New Zealand Dollar. About $1 NZ is equal to $.70 US. around $13 NZD. However, eating out seemed much more reasonable than Australia. activities; All Blacks (rugby team). 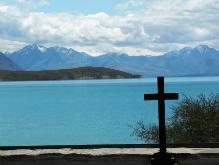 View from the church at Lake Tekapo.